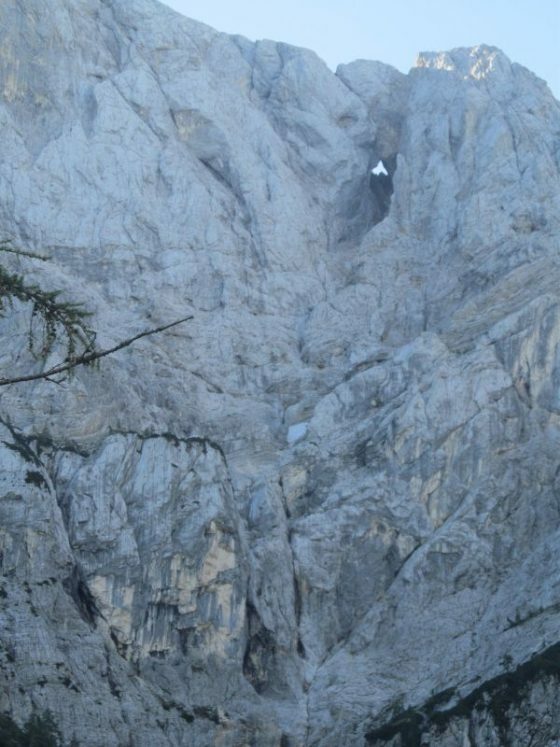 Driving through the Vrisc Pass and the heart of Triglav National Park is a must if you are visiting Slovenia. 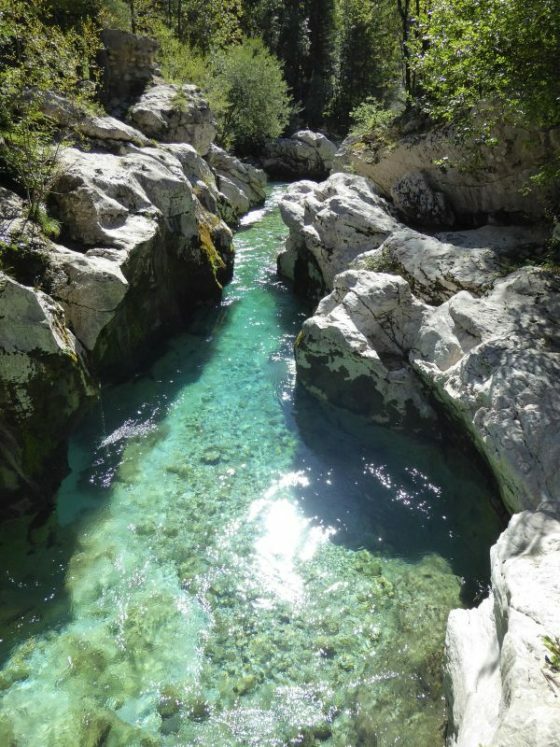 Maybe even more stunning are the Soca Valley Slovenia and the oft photographed bright blue Soca River that runs through it. Slovenians hold this region and its namesake, Mount Triglav, in such high esteem that they place it on their flag. 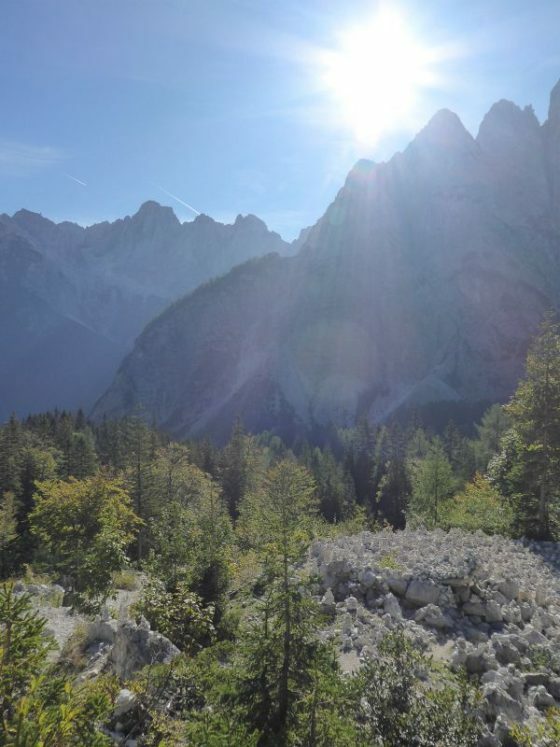 Visiting the Slovenian Alps and the Soca River is one of the easiest day trips from Lake Bled. The beginning of the Vrsic Pass is approximately 45 minutes north east of Lake Bled near the town of Kranska Gora. The Vrisc Pass consists of a windy road with 50 switchbacks. The road was paved and generally two lanes all the way down (which is more than I can say for many other roads in Slovenia.) The road is safe and in good condition, so no worries about that. While doing my research for our trip to Slovenia, I was poring over travel websites and other blogs, trying to figure out the best stops to make while driving the Vrsic Pass and the Soca Valley beyond. What I discovered during our visit is that detailed research really wasn’t necessary as it really wasn’t that complicated. If you want to visit this special part of Slovenia but are short on time or without a car, this is one of the top tours in the area. 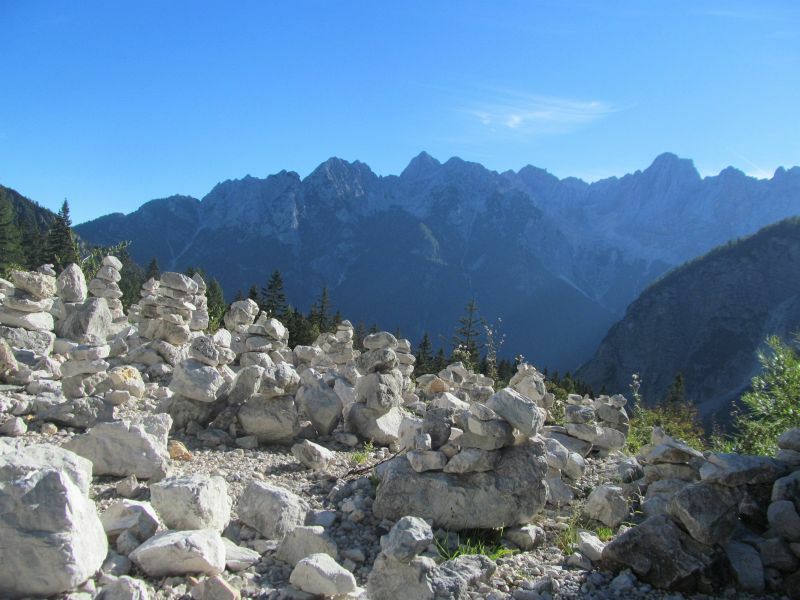 It combines the top activities in Triglav National Park and the Soca Valley into one epic day! 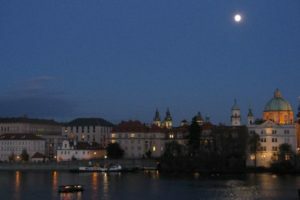 A note about planning – we were staying near Lake Bled. While the pass doesn’t take that long to drive through, we knew that we also wanted to spend some time exploring the Soca Valley Slovenia. We did in in one day because we knew that we weren’t going to be back in this area again, but it was A LOT of driving. There is a car train to take you back towards Lake Bled through the mountain once you are done in the Soca Valley and this would save some time, but we didn’t make it there in time. For this reason, I would schedule an overnight stay in the Soca Valley if possible. There are well researched suggestions for Soca Valley accommodation towards the bottom of this post. To smoosh this all into one day (do as I say, not as I do), start early in the morning and head for Kranska Gora. We put the kids in the car while they were still sleeping and stopped for breakfast in Kranska Gora. Make a stop for some photos at Lake Jasna (we missed out on this because it was October and it was CHILLY and we just weren’t up for it with two sleepy kiddos). With stops, driving through the Vrsic Pass Slovenia took a couple of hours. You can easily get carried away with stopping at EVERY possible pulloff. All of the turns on the pass were beautiful. Stopping at every single turn with two kiddos just wasn’t feasible for us. Here are the ones that we stopped at on the Vrsic pass that were especially noteworthy. Erjavceva Koca Mountain Hut – Just below the top. Cafe with stunning views, the starting point for some noteworthy hikes in the area. The top of the pass – Beautiful viewpoint with small cafe and herd of sheep. Stunning views and amazing photos. Parking can be tight here – getting here early helped. During the busy summer season, it would be essential. Wooden viewing platform just past the top: It wasn’t at a numbered stop, but not far after we passed the summit we stopped at a wooden viewing platform with amazing views and remnants of a WWII cable car system that had supplied the allied troops during WWI. There were less stopping points on the Soca side of the pass than there were on the way up. We made our way down to the Soca River. Just Past the Top: The Viewing platform just past the top of the peak of the Vrsic Pass was definitely worth stopping at! We saw these views as well as the remnants of a cable car system used to supply troops here during WWI. There were not very many restaurant options in the Vrsic Pass itself. The Erjavceva Koca Mountain Hut is located just before the peak. They have a cafe serving simple, satisfying mountain fare. The only other restaurant that we saw was after the peak heading down the mountain towards Trenta. This restaurants was called Gostlina Metoja and it also looked like a nice place to stop. The blue Soca River near our first stop at Trenta, the first village after we came out of the Vrsic pass. Again, there are SO MANY places that you can stop to take photos of this river. You could easily spend an entire day, though it is not necessary. The first stop that we made was near the village of Trenta, shortly after the last numbered turn of the pass. There was a super photo worthy suspension bridge and we stopped for a picnic. This bridge was more rustic than some of the other ones that we saw as we drove down, and I liked the rustic look against the bright blue water. Thanks to following the directions of one of my favorite bloggers at Zig Zag on Earth, I found my FAVORITE Soca River photo stop….TD Soca Lepena. I almost missed the sign. 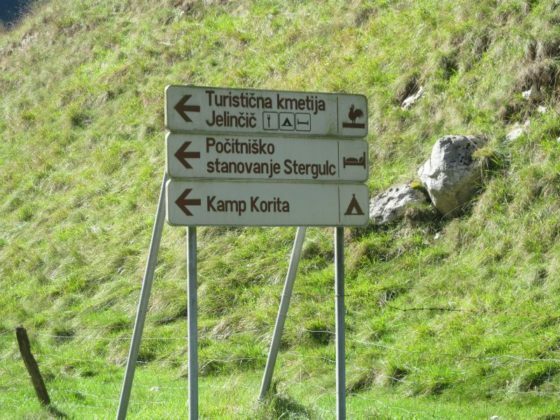 It is at the place where the sign is for Kamp Korita and Tourist Kmetija Jelincic. After this stop, I didn’t feel the need to stop again because I was pretty sure the views could’t be beat. 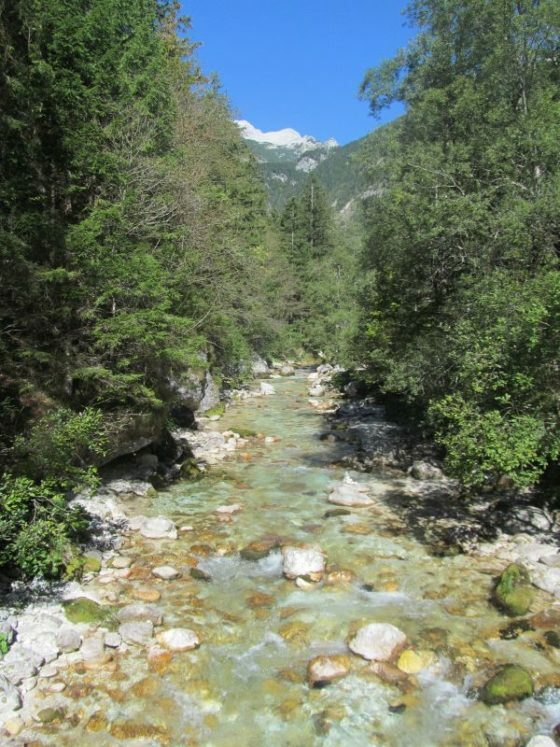 The view from the bridge at my favorite Soca River Slovenia photo stop. 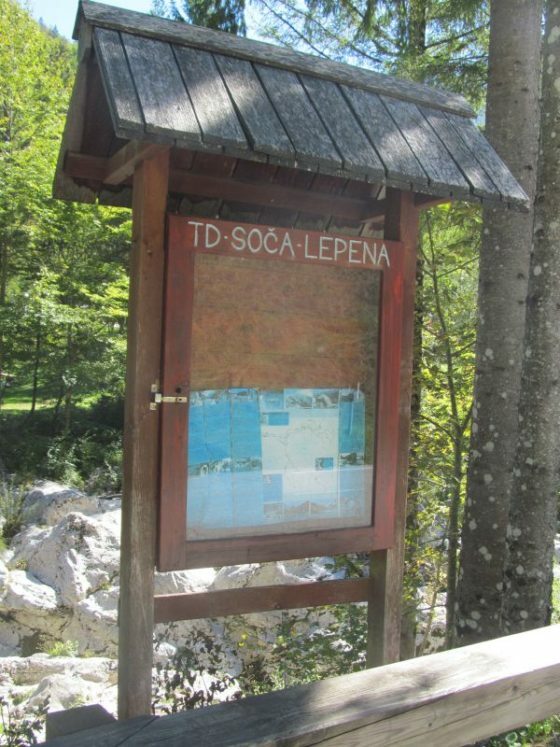 Our favorite stop along the Soca River – TD Soca Lepena. There is nothing else to designate this spot other than this sign (the was on the left side, at the parking pull off near the river). Eventually, we had to pull ourselves away from taking more pictures of the Soca River Slovenia to move on to other sights. The Virje Waterfall was an easy and rewarding hike. It took us less than 15 minute to walk from the parking area to the waterfall, even with small kids. Slap Virje (Slap is the Slovenian word for waterfall) is an easy 10 minute drive out of Bovec. The Virje waterfall is captivating as it tumbles over the rocks and drops into an emerald colored pool at the bottom. A note for the photographically obsessed – we got there late in the afternoon. The sunlight would have been better a couple of hours earlier but it was still worthwhile. If you want more hiking, there are trails that head up the hill from the waterfall (they are on the right side when you are facing the waterfall). If you go up higher, there are a couple smaller falls and beautiful pools to see. It was too steep to take little ones on, but someone in our party went up while the kiddos ran around a little and we enjoyed the waterfall. The Boka Waterfall is also on the way, not far from Slap Virje. The waterfall was dry when we visited so we didn’t get to see it in action. The captivating Virje Waterfall in the Soca Valley was a relatively easy hike for these views. The majority of the 15 minute hike to the Virje waterfall looked like this. Our last stop in the area before heading back towards Lake Bled was at the Kolvrat Open Air Museum. We have visited many WWII history sights during our travels. When I read about the intense and critical WWI battles that took place in this area, I knew that a stop here was a MUST. 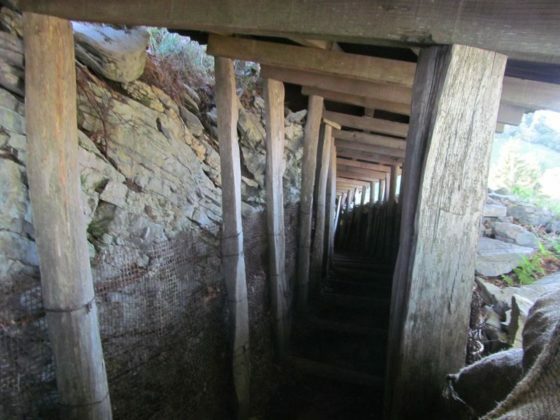 The museum is a series of restored WWI bunkers on the border of Slovenia and Italy. You can walk through and explore the bunkers on your own. The area also yields panoramic views of the surrounding countryside. We visited here in the shoulder season in October and had the place all to ourselves! We did not have enough time, but there is also a WWI history museum in Kobarid that would certainly be worth a visit. Views of the countryside near the Kolvrat Open Air Museum were spectacular. The Museum is right on the border of Slovenia and Italy. Being able to walk through restored WWI bunkers at the museum really brought WWI history to life for us. This had been the site of one of the hardest battles of the war. Views from the Kolvrat Open Air Museum. You can see the outlines of some of the bunkers covered over in grass crisscrossing the hillside. There are so many things to see and do in the Soca River Valley. Here are some of the things that were on our short list. Rafting the Soca River: Rafting on the beautiful Soca River is a popular activity. Soca Rafting offers a variety of rafting trips including a short, super easy one suitable for kids! The Kanin Cable Car: The Kanin cable car offers mountain views, a via Ferrata and abundant hiking opportunities. We did not do this because the hikes are not short enough for small kids, but probably would have otherwise. 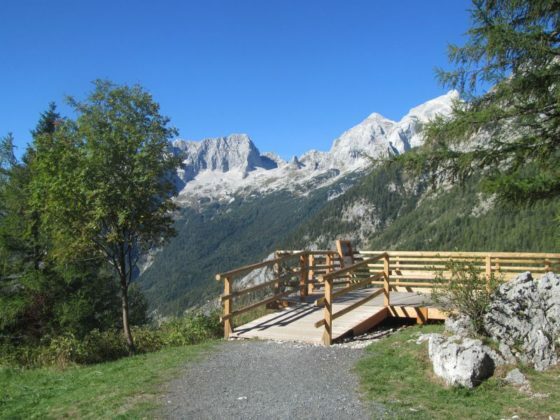 The Bovec Adventure Park: The Bovec Adventure Park offers a high ropes course and ziplines that look pretty exciting. What we loved about it was that they offered a ropes course and zipline suitable for small children that is much closer to the ground than the adult one. 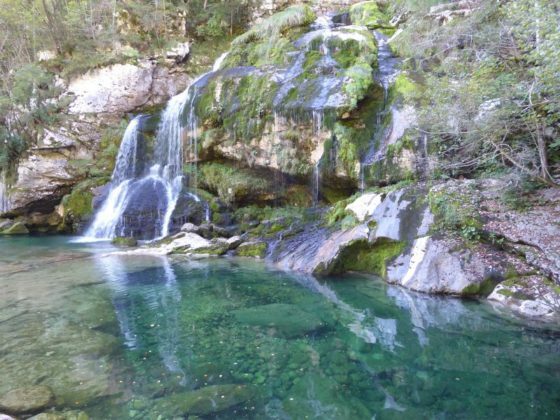 Slap Kozjac: This waterfall is close to Kobarid and it is very worthy of the 2.5km/90 minute hike! it falls over the edge of the rock into a cave and green pool below. The Tolmin Gorge: A spectacular gorge that is accessed via a relatively easy hike just outside of Tolmin, Slovenia. Has we stayed overnight and had part of a second day, we definitely would have tackled this. 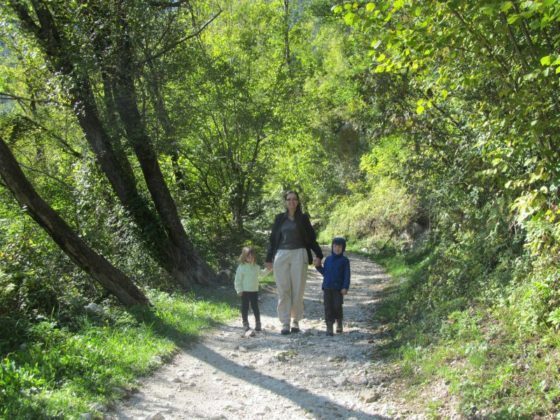 The Soca Valley Slovenia has a great selection of family friendly apartment rentals in all price ranges. A quick search on Booking.com should bring up loads of good options. 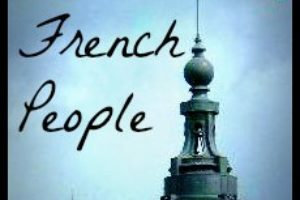 Here are a few that are at the top of my list. 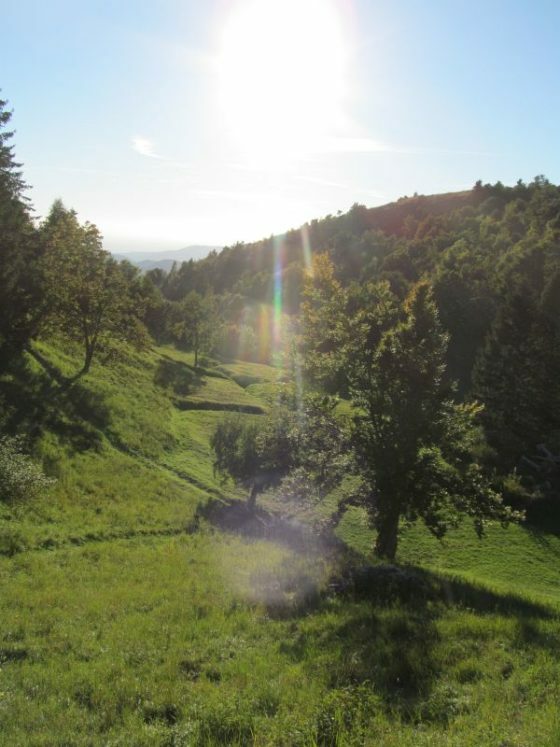 Tourist Farm Pri Plajeru: We loved the farm stays that we experienced in Slovenia. Tourist Farm Pri Plajeru looks equally amazing. This tourist farm is located on a quiet road close to the Soca River near Trenta. They offer the option for breakfast and dinner at a reasonable rate. The farm looks super family friendly! Tourist Farm Jelencic: This farm stay was on our radar because it is on the same turn as my favorite Soca River photo spot above. The Tourist farm Jelencic is on a perfect spot on the Soca River. They offer a variety of accommodation options and a playground for the kids. The food looks scrumptious! Fresh cheese, fresh bread and river trout…bring it on! Hostel Soca Rocks: We are big fans of staying in good, family friendly hostels. We enjoy having kitchen access, they are generally budget friendly and we like staying in simple rooms without all the extras. Hostel Soca Rocks seems to hit all of those buttons. They offer private rooms with varying configurations of bunks beautiful views of the mountains, a shared kitchen and a great location. Super clean and no reports of crazy parties puts this into the “family friendly” category in my book. 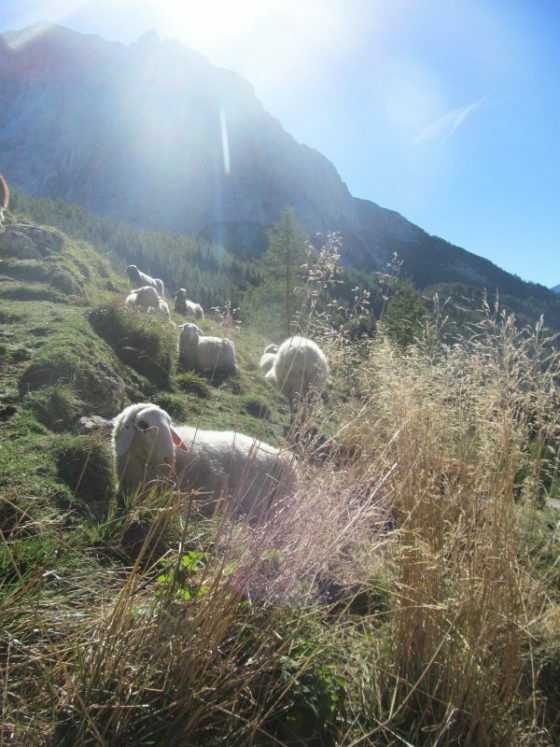 I have some truly lovely options to offer for camping/glaming and budget accomodation in the Soca valley. 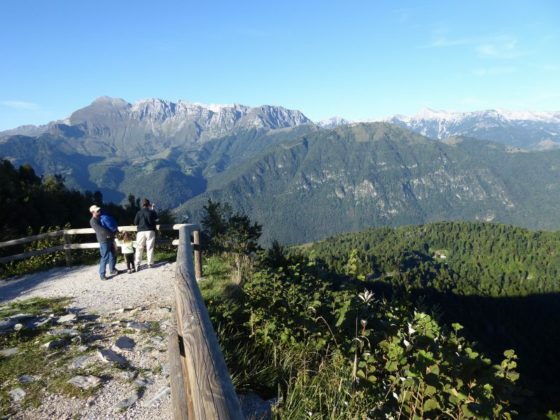 Kamp Korita: The first is located in the Soca Valley before the town of Bovec. Kamp Korita is has a wide variety of family friendly accommodations available including a hostel, campground and super cute A frame cabins right on the river, among others. We SOOO would have stayed here had we known about it ahead of time! We SOOO would have stayed here had we known about it ahead of time! It is located at my very favorite Soca River photo stop (which I talked about above). They have some basic food options and an AWESOME playground. These cute little cabins at Kamp Korita are right on the river at our favorite Soca Valley Slvovenia photo stop! Kamp Koren: The second Soca camping option that I would put on my short list is a stay at Kamp Koren. 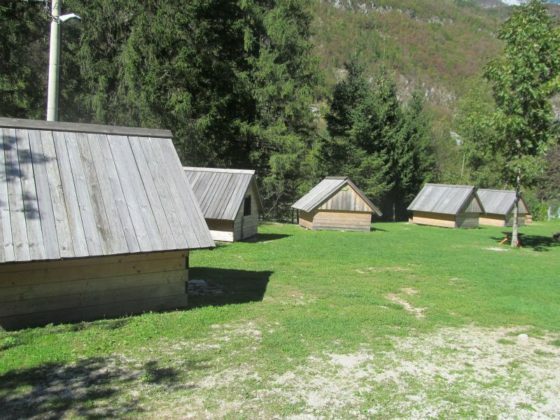 Kamp Koren is located near Kobarid, Slovenia. They also hold down a stunning spot right on the Soca River and offer campsites, simple “glamping” huts and more elaborate chalet style cabins. Sovdat: This restaurant was recommended to us by a couple different folks along the way. They offer authentic, Slovenian cuisine at a good value, good salads (sometimes lacking in Slovenian cuisine) and kids meals! You can read a glowing review of this Bovec restaurant here. Kuhnjca: This is a food stand located on the Bovec town square. Sadly, we visited in the off season and they were closed. They offer take our versions of local Slovenian specialties home made with love. Gostlina Pri Mostu: This restaurant is located on the main Soca Valley road past Bovec in the village of Zaga. Large portions, fair prices and reviews of good food (especially pizza) put this on our list. Kamp Lazar: A casual, outdoor restaurant near Kobarid right next to the river. There is plenty of room for the kids to burn off some steam while you are waiting for your food. It gets decent but not stellar reviews on Tripadvisor. Sometimes, room for the kids to run around is more important than stellar food 🙂 This restaurant is close to Slap Kozjac if you are planning on tackling this family friendly hike! Camp Nadiza: A basic restaurant near Kobarid Slovenia with an AWESOME playground! 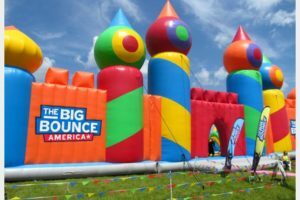 See note above – sometimes basic food is worth it for a great playground!